Note: If your rims has any scratches etc, it is important that you fix them now through sanding/bondo. The primer and especially the paint will not cover these defects for you. 12. Spray a light coat of clear coat on the rims, wait 10 minutes and repeat until you have around 2-3 coats. btw, how long did u take to finish 4 rims? great write up man. the cue cards, would have never thought of that!.. did you try to get the inner wheel behind the spokes painted or no? i want to get mine paint matched to my car with a chrome or somehting silver lip. ok so in canada wheres the best place to pickup this. with the most selection? i may jsu thave the shop do it since im getting so much other workd one. ill have to price it out. what does the Dupicolor Sandable Primer look like, i have been to canadian tire, walmart and zellers and i can't find it. Is the primer really necessary? And before anyone gives me **** for doing a sad job, and painting steelies, look at the before pic and tell me it doesnt look better now... Which is all i was going for. 5) let them dry in the sun for an hour or so. 6) Sprayed with duplicolor wheel paint. 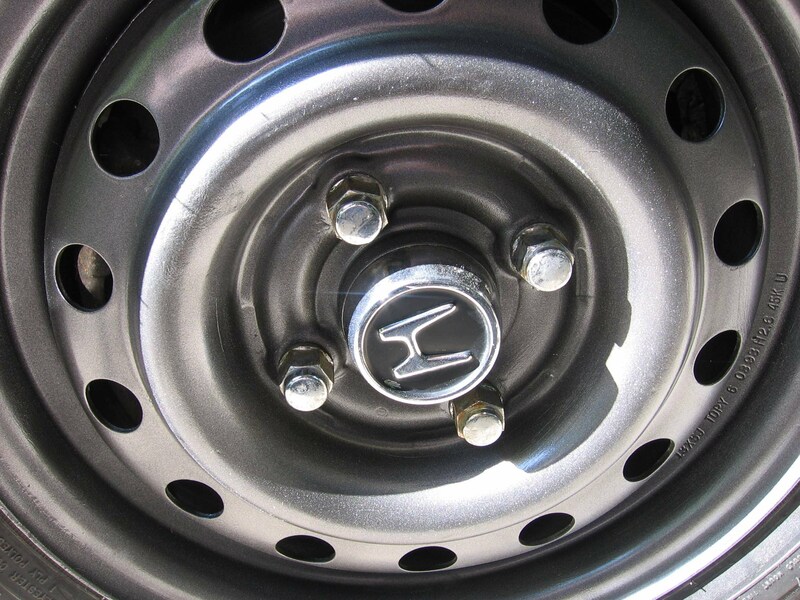 If i was painting wheels that were actually worth something, id probably have taken my time and done a proper job. But its just temporary, so i think it turned out pretty good. The paints also holding up pretty well, i did that a month or 2 ago, ive hit it with the power washer a whole bunch of times, and i even slipped with the tire iron and hit the wheel, no paint chipped off or dented or anything. So i dont think primer is needed with the duplicolor paint as long as you somewhat prep the surface before hand. Also i dont think the can mentions anything about primer, just the clear coat, which i also didnt use since i didnt want a really shiny look. you dont absolutely need primer but it helps, when doing a real good finish it sometimes helps, and it will generally adhere better vs a regular surface. 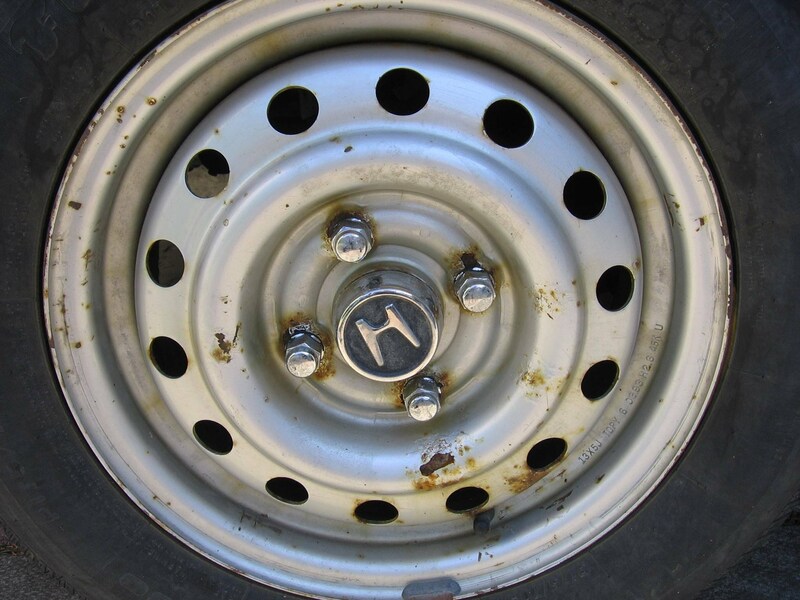 but thats why sanding also must be done so that the surface paint can grab onto the wheel. in some cases the paint may be good for a year or so but after different temperature changes and wear it could start to peel or flake off. Cheap way of painting them.. u could get them done professionally at a shop for 75 each! If you paint a few coats of the main colour paint then wet sand with 2000+ grit sand paper, then apply a few coats of clear coat and wet sand that with 2000+ grit paper then polished and waxed them I'm sure you could get a near perfectly smooth, mirror finish that looks like it was done by a pro. it took me about 2-3 hours of work doin the same thing, plus ive done this like 10 times now on diff rims so my hands are kinda fast in it now. but it shouldnt take more than that for a starter either. all i did was to first sand, and then wash with soap and water, let it dry, masked off the tire from the wheel, and then spray on 2-3 light cots of paint, and then if u wanted not to get scratched where easier then do 1 or 2 cots of clear. well i sprayed flat black and if i clear that its gona become a shiny black and no point to it. where to get aircraft stripper? Rim paint remover, aircraft stripper too strong?